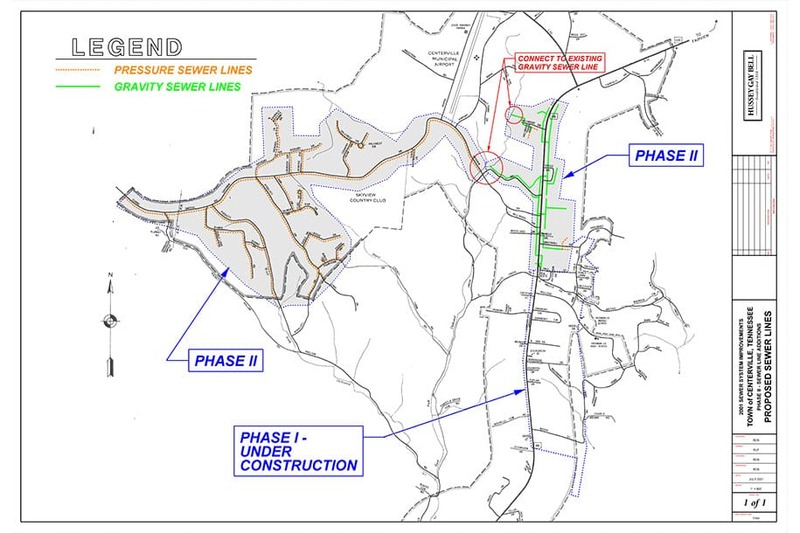 Phase I of this project consisted of the preparation of environmental, preliminary and final engineering reports, design, construction administration and resident inspection for the construction of approximately 460 linear feet of 16-inch steel casing pipe; 33,000 linear feet of 8-inch ductile iron pipe gravity sewer line; 5,500 linear feet of 6-inch force main; 2,800 linear feet of 6-inch service pipe; 217 manholes; a new sewage lift station and appurtenances utilizing USDA/Rural Utility Service and State Revolving Loan funds with construction cost of $1.2M. The scope of work for Phase II consisted of the preparation of environmental, preliminary and final engineering reports, construction administration, construction observation and project close-out for the construction of approximately 6,800 linear feet of 6-inch force main; 9,250 linear feet of 4-inch force main; 25,000 linear feet of 3-inch force main; 23,600 linear feet of 2-inch force main; 310 simplex grinder pump stations; 15 duplex grinder pump stations; 250 service connection assemblies; 315 electrical services and appurtenances with a construction cost of $2.93M utilizing USDA/Rural Utility Service funding. Construction on wastewater collection system improvements for the Town of Centerville began in 2001 and were completed in 2002, which consisted of over 106,410 linear feet of improvements.